Leafing through these recipe books provides an ongoing education in how common certain dishes were in early modern cooking. Some, like fried cream or (ahem) fish custard, seem to occur only rarely. Others, like jumballs or various puddings, appear time and again. Selecting one recipe to try in these cases is something like settling on a chocolate chip cookie recipe today: you happen to have chosen that one, but there are numerous others out there. I thought syllabub would be a great test case to show what one dish can look like across multiple recipe books. The syllabub recipes below all combine cream, white wine, and sugar, then thicken the mixture. Proportions of cream to wine vary. Some “solid” syllabubs are left to sit until the cream and clear portions separate by themselves; other “whipped” syllabubs strain the froth over a sieve, then dollop the thickened mixture on top of white or red wine. (This vocabulary isn’t entirely consistent, and other adjectives like “ordinary” and “excellent” complicate matters.) 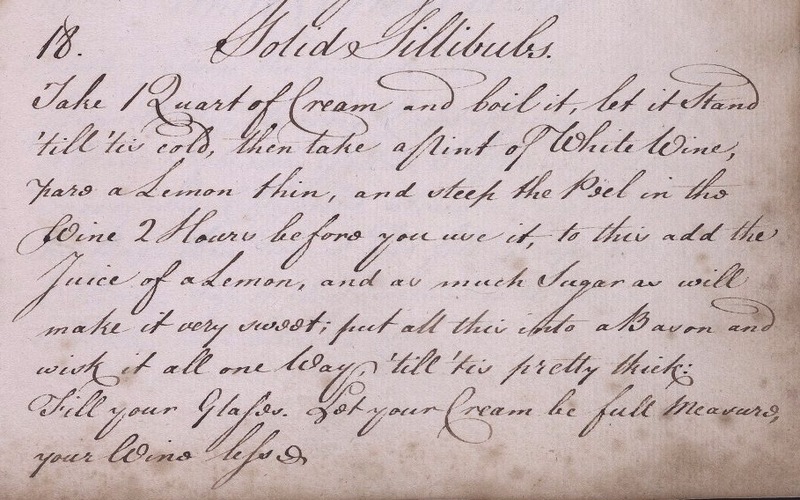 Recipe books might contain one or two or even, in Judeth Bedingfield’s case, three syllabub recipes. (Print cookbooks contained even more: Mary Cole’s The Lady’s Complete Guide; or Cookery in All Its Branches  details five, ranging from “lemon” to “everlasting.”) The handful of syllabub recipes below allow us to consider how cooks write out similar instructions in different ways, vary or omit steps, create flavor twists, and put their own mark on a somewhat standard recipe. 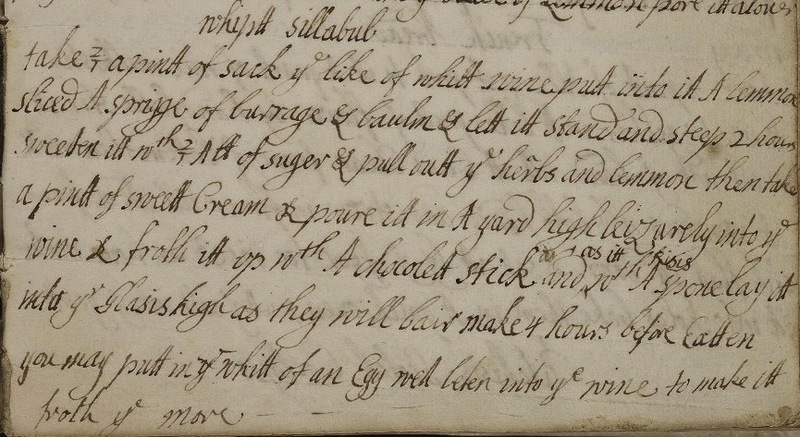 Make your syllabub of either cyder or wine, sweeten it pretty sweet, and grate nutmeg in; then milk the milk into the liquor: when this is done, pour over the top half a pint or a pint of cream, according to the quantity of syllabub you make. 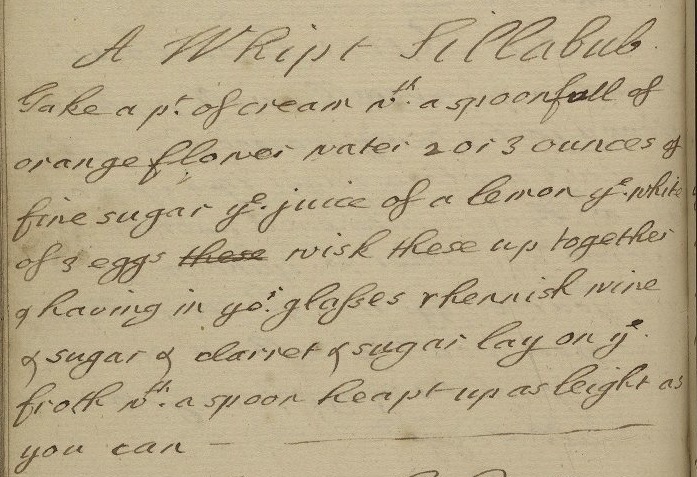 You may make this syllabub at home, only have new milk; make it as hot as milk from the cow, and out of a teapot, or any such thing, pour it in, holding your hand very high, and strew over some currants well washed and picked, and plumped before the fire. I was tempted to try this technique in my cow-less kitchen, but I stuck with the instructions from MS Codex 205. In a small saucepan, bring cream to a boil; let boil gently for 2 mins. Remove pan from heat or pour into heatproof bowl and let cool. Meanwhile, place the lemon rind in the wine and let sit for 2 hours. Remove the rind, then add the lemon juice and sugar. Combine the cream and wine mixtures and beat with a stand or electric mixer or by hand* until frothy and slightly thickened. Pour into 2-4 glasses and refrigerate 4 hours or overnight; the cream will thicken and a small layer of liquid will appear below. *At first I beat the mixture by hand and assumed that my arm power was the reason it didn’t thicken significantly. But when I transferred it to the stand mixer, the thickness remained the same. It should become frothy and be well-combined, but it won’t thicken like whipped cream. A word about methodology: without reading up on other syllabubs, I wouldn’t have known to let the mixture sit. And I feel fairly certain that it should sit. Almost all the syllabub recipes, both handwritten and printed, that I read called for the mixture to be strained or to sit. A thickened layer of cream on top of a more liquid wine layer is characteristic of syllabub. So why not specify that step in this recipe? I think this is a good instance of a step being left implicit because the cook doesn’t think twice about it. It made me think of what we leave unspoken in our own recipes. Have you ever written down a well-loved and much-made recipe for someone else, then paused and added in more steps and specifications for someone making it for the first time? I think that’s what happened here. This first-time syllabub-maker didn’t know any better, even if the recipe writer would have. Without letting the mixture sit, the whole thing is creamy but very liquid, not thick or “solid” at all. I didn’t like this quite enough to keep experimenting with other syllabubs – plus, there are other refreshing liquid desserts to tackle before the end of the summer. Shrub! Posset! But if anyone feels moved (er … moo-ved?) to try “Syllabub from the Cow,” please report back. I was a witness to the making of syllabub with a cow at Pennsbury Manor many years ago. We had a pewter mug of beer, and milked the cow right into the mug of beer, which frothed up nicely and tasted much better than it sounds. The force of the milk is kind of like what happens when you use those fancy expresso machines and add the hot milk to a cafe con leche. They are trying to accomplish the same thing by pouring the milk/cream from a great height (via the tea pot) into your syllabub cup, but I agree that you are more likely to make a mess than a good syllabub in that way. The very best way to make syllabub is to pour the cream into sweetened white wine from on top of one of the bridges at Raglan Castle in Wales. (Speaking from personal experience here). 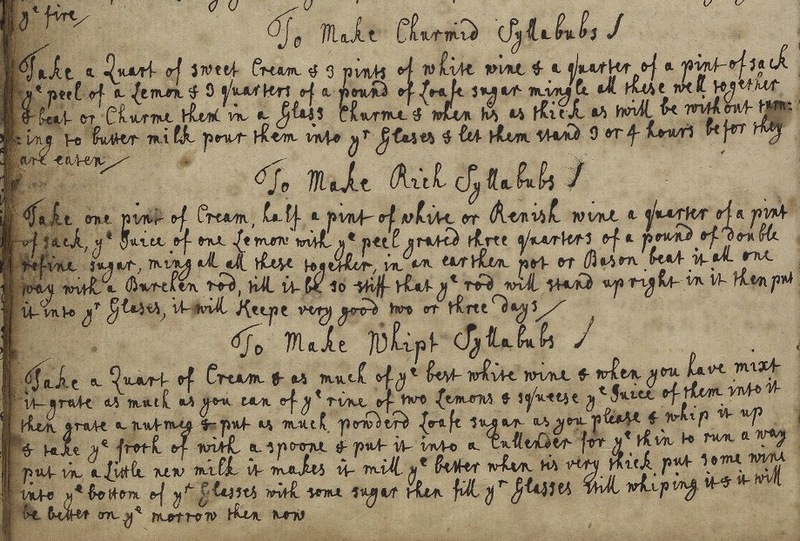 Our medieval version of syllabub has just those three ingredients, and we term it “medieval milkshake”. It’s so tasty, we can hardly ever make enough. SO delicious! Amazing to learn the recipe….and the history behind it.. Wonderful post and I love syllabub. I’d lost you so I was delighted to see you in WP’s recommendations! This was a wonderfully timely piece, Alyssa, as I just finished a historical fiction novel where syllabub made an appearance, and although I had plenty of recipes from which to draw imagination from, seeing how it looks within your post has not only solidified my mind’s eye, but now made me desperate for a taste of it. A hankerin’ for syllabub. Not a phrase I’m guessing will be on the cover of Bon Appetit, but it probably should be. This is very similar to the recipe Jane Grigson published in “English Food” as “Everlasting Syllabub”. She got it from Elizabeth David. I make it often, but always with two differences: They add a couple of tablespoons of brandy, and have you serve it right after you whip it. It does not seem nearly as appetizing when it separates, as in the recipe here. I do believe Elizabeth David did quite a bit of research to come up with this recipe, so the similarity is not surprising. “Solid” and “ever-lasting” were apparently interchangeable names for this sort of syllabub, as opposed to the liquid “from a cow” kind.